I can really tell when I’m enjoying internet surfing with the fastest internet speed; and I can tell when it’s slow. I make up this post because of those that are in one way or the other finding it difficult to subscribe for the Airtel 4GB. Surprisingly, I noticed myAirtel Gigsis not actually moving as in excessive zappingof data for the past few days as it used to..
May an adjustment have been made, but I can’t really say. So many of us have wondered why on earth Airtel will select those they share the 4GB data plan with. Why won’t your sim be eligible for the plan? Ideally, dialing *440*161# should let you know if you are eligible or not. Unfortunately, many are not eligible. Early hours of this morning, a committed blog contributor in person of Mr Ben share with me this method of easily getting eligible for the Airtel 4GB; after Airtel told him that he’s not eligible for the plan. Two weeks later, he tried the code below and he was told Eligible. 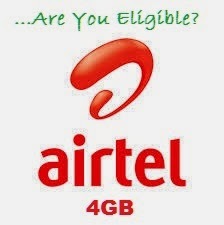 How Can I Be Eligible For the Airtel 4GB Plan? It’s so simple; it’s all wrapped up in a code. Dial *440*440# Once you dial the code above, if you are lucky enough, you will get an eligible message. And if you didn’t get an eligible message, keep your SIM for some couples of weeks and try it again. 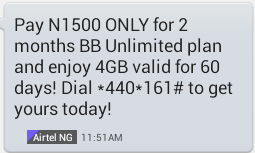 Mind you, this Airtel 4GB for #1500 works on all device including Java phones.